PUNTA GORDA, Wed. June 7, 2017–The southern districts do not usually make it on the annual roster of top 25 performers in the Primary School Examination (PSE), but this year, Devyne Lopez, 12, of Punta Gorda Methodist School, achieved a major milestone not just for herself, but also for her school and community when her name appeared third on the list. Speaking with Amandala today, Devyne revealed that it was her mission to attain 95% on the PSE. Her sister, Hyddie Lopez, this year’s valedictorian at Julian Cho Technical High School in Punta Gorda, had scored 92% when she sat the PSE. “My father said [since my sister got 92 on the PSE] I can get 95! So I started working until I achieved the 95,” said Lopez. It so happens that the 380 points she earned out of a total of 400 for English, Math, Science and Social Studies, computes to exactly 95%. Devyne is daughter of career educators Winston Lopez, vice principal at Julian Cho Technical High School, and Doris Lopez, vice principal at Punta Gorda Methodist School. The student told us that at school, they did morning and evening classes, starting last September, to help them prepare for the PSE. Preparation included the sitting of mock PSE exams, some of which Devyne found challenging. “You don’t only depend on the teacher. You have to help yourself and your parents have to be with you and support you through the whole time,” said Lopez, who aspires to join her aunts and uncles in the US Marine Corp.
Westby, who has taught standard 6 for the past 5 years, told us that Punta Gorda Methodist School has maintained a fairly high rank at the district level, and they always aspired to make it into the top 25. In 2013, Punta Gorda Methodist School received an award from the Ministry of Education for the best overall performance in category 3, in awards issued based on the size of the school’s cohort which sits the exam. They have come as close as 27th and 26th place, and now they appear among the top 3. The task will be to try to remain among the top 25 – a feat that Westby hopes they can accomplish in the years ahead. As teachers, he said, they did what they had to do to help prepare their students. “What helped us a lot this year is the increase in the use of technology,” he said. “We recently received [donated] projectors and tablets… and they really played a significant role. The old ‘chalk and talk’ method is worn out. They are more receptive to technology,” the educator explained, adding that the improvements they see in the school’s overall Math grade could be attributed to the integration of technology in teaching. It is noteworthy that Toledo did not just attain one spot among the top 25 for this year’s PSE. The district additionally claimed the fourth place on the roster. 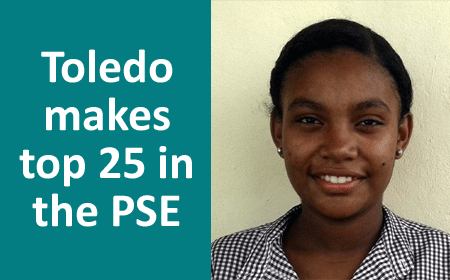 Leeanne Palma, 13, student of St. Peter Claver RC School, earned 378 out of a possible 400 points. “At first I was shocked! I didn’t believe that I had scored that high, but it soon settled in,” said Palma. The subject she found most challenging was Math, and specifically, problem solving. The writing portion of the Language exam also posed a challenge, but Palma, who said that she found portions of the exam to be exhausting, told us that her performance on Math was the biggest surprise. She got 45 out of 50 points for problem solving. “Everybody around me is so proud! It’s like they can’t believe it!” she said. 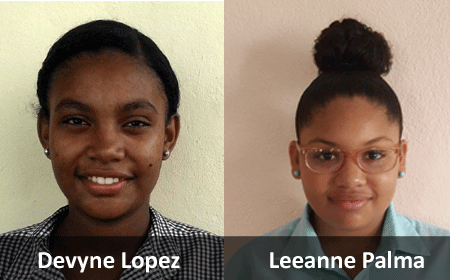 The Dangriga-born student, the daughter of Lilietza Tellez of Cuba (who grew up in Belize) and Ray Palma of Belize, plans on attending the Toledo Community College and to later study architecture. Palma told us that apart from the extra classes she took at her school, her entire family banded together to help propel her to success. Her mother, an infant school teacher at an elementary school in Crique Jute, helped her with Language, and her dad, who teaches physical education and agriculture at Toledo Community College, helped her with Math and the mock PSE. Meanwhile, her aunts and grandparents helped her with Social Studies and Science. “It was a team effort,” said Palma, adding that the entire family will be celebrating the milestone. “The teachers worked quite hard. We hid and worked when there was [the teachers’] strike. We took them to our houses,” confessed Florence Ramclam, principal at Punta Gorda Methodist School. She said that she doesn’t think they’ve ever placed in the top 25, although they’ve always been among the top 10 in regionals for the south of Belize. Ramclam told us that making the top 25 became her goal 3 to 4 years ago, and that goal has now become a reality. She describes Devyne as “an exceptional student,” who she was confident would have done well on the PSE. She was pleasantly surprised when she learned that Devyne landed 3rd place. “She is very dedicated. She is the president of our school council – a born leader!” said Ramclam. “I believe Toledo can be up there. We made it!” said Ramclam. “Next year we’ll take 5 more [top spots], not only one!” she added.